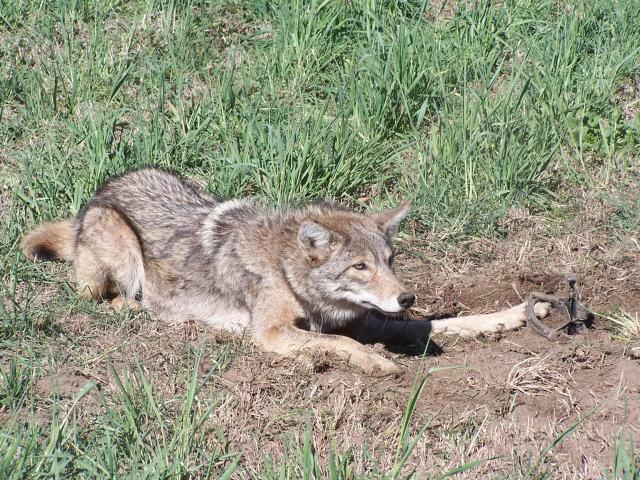 Several sheep farms have been hit hard with coyotes this spring. It has been the worst I have seen in many years. All over a 3 county area. I cant keep up with the calls and have had to turn folks down. Early April on has seen dozens of kills. Eastern coyote work has its challenges. The coyotes come in and kill then don't return for weeks in some cases. Some are kill for the sport attacks in some areas just cause they can. They will kill 4-8 lambs and maim other lambs and ewes then only eat one or two lambs. These lambs are about 25#. 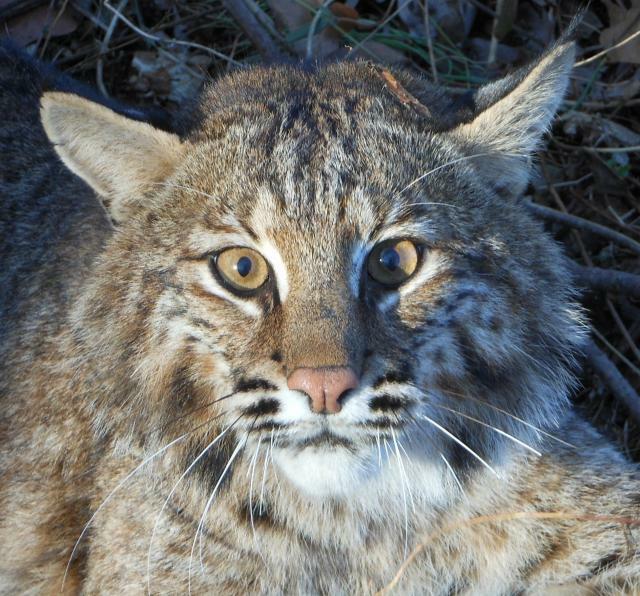 They will often drag or carry one back to a feeding area or den that isn't found in the immediate area. Many times all you will find near the kills are the stomach and intestines that obviously aren't eaten.These entrails will be cleaned up in a few days by other animals and birds. Get familiar with the attack areas of the bodies as they can vary at times. 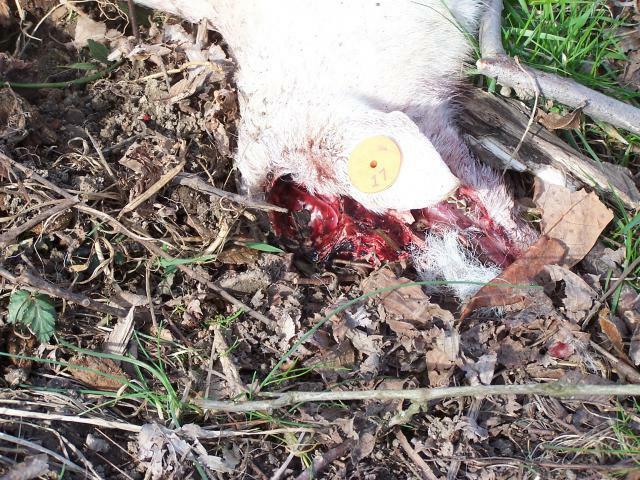 The skull, neck and side of the face are common attack areas for coyotes on lambs. Some have bite patterns on the back and spine as well on many kills. Coyotes like the skulls and eat some completely off the bodies. The lambs skulls are soft at this age and the brains are a tasty delight I assume for them..
Not a pretty sight being quite costly and frustrating for these sheep operations. This sheep trail leads back to a small shelter. One lamb kill can be seen lying near the end of the trail to the shelter on the right of the photo. "Hombre que mata demasiadas cosas"
Didn't know they ate the heads like that. Thanks for sharing Bob! Gourmet predators like brains, and that is usually older adults. Patterns in Great Horned Owls eating brains and dry land mink. For nostalgia purposes, when Richard Nixon banned poisons and the EPA took off all suitable off the shelf poison control, the coyotes appeared. Yes they had some help in transplants from "hunters", but it was the same early 1980's era that saw the racoon plague in the east when Florida banned trapping. American wildlife policy is not effective any more. It is easier to raise large predators who do not vote, than to raise what Teddy Roosevelt stated was proper wildlife policy along with John Burroughs (Godfather of Yosemite) in killing all the large predators and leaving only the suitable wildlife for humans to harvest. 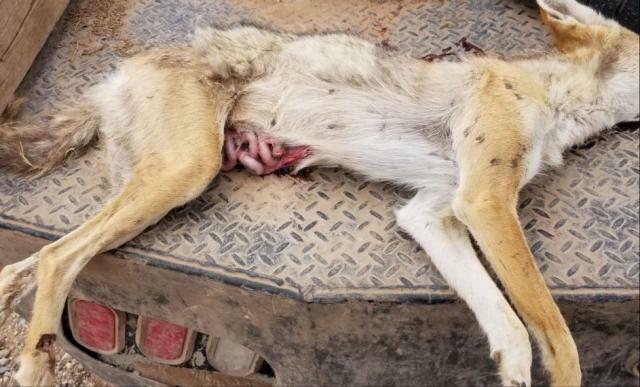 America needs an eradication program for everything from ticks to coyotes, because nature is finding a way through ticks to crop the surplus humans and coyotes run through cycles of mange which spread to domestic animals. These yotes were raised on lamb and in most situations the reason they were raised on lambs is because all the fawns were killed off. It is not like when Ronald Reagan was president in cheap gas, cheap ammo and 500 dollar pick ups, so that weekend roaders were always picking off these predators for good fur prices to keep things in check. Most people can not afford a license and most people can not afford to call ADC and the state employees for the most part are as dense as the one who told me a raccoon had killed 2000 dollars worth of chickens. I informed the college boy that raccoons do not carry off birds. To that he just blinked stupidly and had nothing to say. It all turned out wonderful as I killed the predator and the state promoted the moron to a higher post of conservation officer. Bob, has anybody out there tried guard dogs? Most everyone I know here in NM has them, as well as lots of other sheep/goat producers across the west. They make a big difference in the flock that I watch after. That, and I can work on the coyotes year round out here. The one rancher had some dogs for several years and they all eventually died. He never got another dog after the last one died. He is in his early 80's now and feels the dog will out live him now so he doesn't want to get one. He has been real lucky not to get hit sooner then he did. I catch coyotes all around his place but you get that one or two that get a taste and they want more. He sent most of this years lambs to auction a couple of weeks after the first coyote attack. He got hit again one month to date with 4 more kills. He is about ready to get out of the sheep business I believe. I'm avail to help......road trip!!! Bob, silly question maybe, why are they staked down? 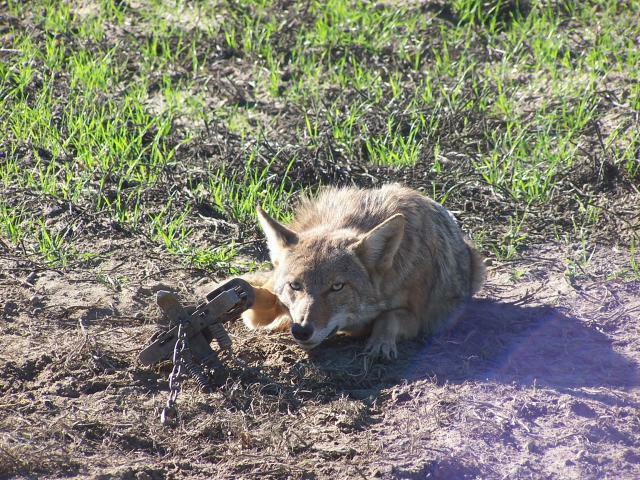 If you don't stake them down the coyotes or foxes will attempt to cart them off. I like to keep the lambs at the kill site. With the small size of the lambs they can run or drag them off. Done this too many times. 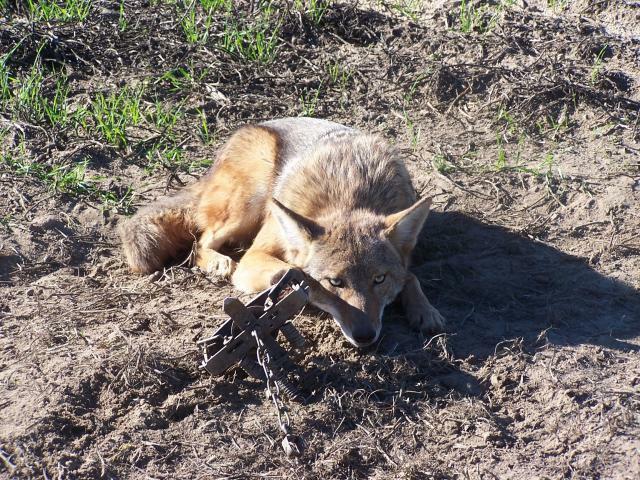 It forces the coyotes to run the access routes I have set up and the snare lines I have placed. Bob, that's too bad to hear about a producer getting out of the business. 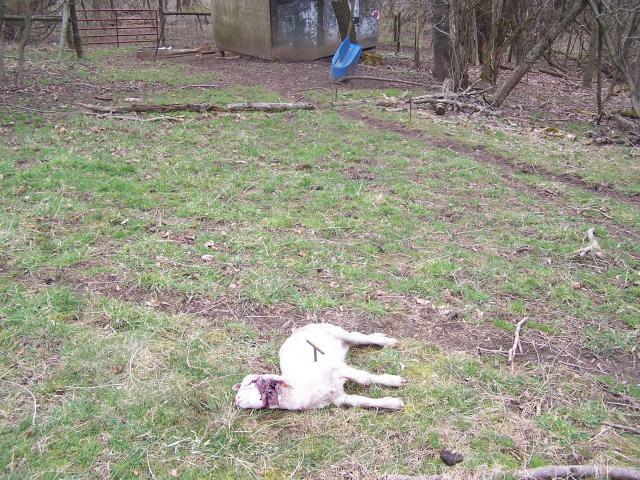 I will say however, there is a down fall to having guard dogs, sheep and net wire fences. Sometimes you catch guard dog, like this morning. Had female that weighed about 130 lbs in a jake on a drag. Took a little work but I got her released, and all with out the catch pole or getting bit. The one before that did not go as smoothly. I agree, I have caught my share of guard dogs in both cattle and sheep operations. No way to really avoid that. Over time they cover all the pasture areas and they respond the same as a coyote to investigate a set. Just how it goes. I explain that to all the farmers and ranchers. Most understand that fact. Thank you for the education, Bob! "We didn't come all the way out here just to 'feel them on the line.' "
I've seen foxes kill that too. They do out it out west in sheep country. That's not to say it wasn't coyotes. Bob Jameson knows a lot about coyotes to be sure. I never think of Pa. as being a state with much of a coyote population. I suppose that could be changing. They will destroy the red foxes if they get a strong hold. I can remember back in the mid 70's telling an Iowa trapper I wish the coyote was in Ohio so I could trap them. His reply : " No you don't. They will wipe out your fox population." And he was right. Anyway, hope you took care of the problem. Thanks for sharing. Good to see a trapper out doing what he does best. Good job. How did it turn out? 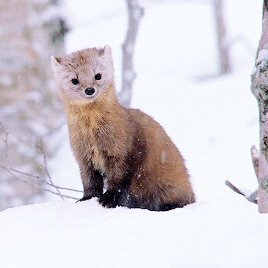 We lost our fox population 30 years ago. I took a few coyotes off our drainage this last winter and guess what? Now people are telling me they are seeing foxes. One guy told me yesterday he saw 3 separate foxes on one country road in three different places. Have not seen a coyote rack all spring. An older pair of coyotes and a younger coyote all caught close to the kill area. The older female was wet as was the younger female. No more kills as of yet. Will have to wait and see in the coming weeks and months. These coyotes all were caught on marking scent set ups. Caught a female coming into one of my sheep pastures last week, in the same hole I caught a male in about a month ago. She was a smart one, had been digging a crossings since I caught the male. A couple of weeks ago she uncovered a trap and flipped it over, but did not come under the fence. I thought for sure I'd be hunting her for quite some time. But, her digging got her caught, only by three toes, but still caught. I cut her open to inspect her repro tract and she had 5 knots on it, one for each pup. She was not still nursing, but you could tell it had not been long since she kicked them off. I have been back in that country twice howling, but have not found them. Will keep trying though, they'll get lonely eventually. They seem to run a pattern here in the East this spring. They come in and kill and maim a few lambs and ewes, maybe eat one completely at the kill site. You just find the stomach and intestines everything else is gone. Then they wont come back for weeks or a month or so. There is lots of food here with our deer herd population, large turkey flocks all over etc. The coyotes have come in close to our place and hit a few of our deer with fawn in the last few nites. Not sure at this time how many fawns were killed but two of the does I have seen in the last two days show signs of bites and tears on their bodies. I wondered where one of the local deer that would hang around the house had been. I hadn't seen her for a couple of days. She had a single fawn this spring as I had seen it on occasion. Most likely the coyotes came in looking for fawns and the doe most likely tried to run them off the best she could or attempted to lead them away from her fawn and paid the price it seems. 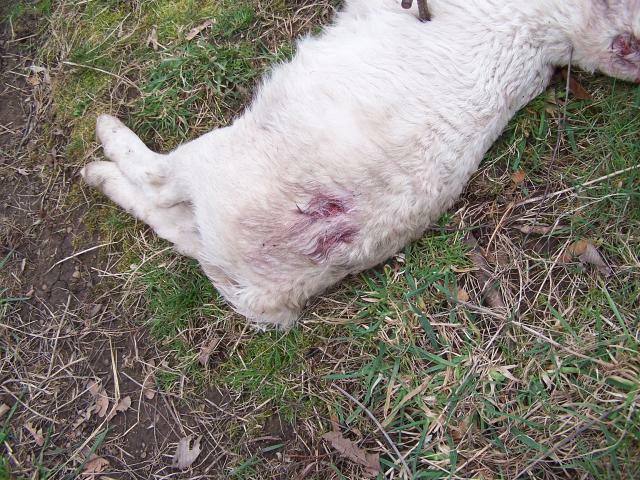 She has a large tear in the hide over her rib cage area opened up with some tissue just hanging down. Nature at work. Will have to see if her fawn survived in the days to come. With the skin tear as large as it is you wonder how these animals survive but many due. Infection and flies are always a problem as with any open tissue body trauma that is exposed to the elements. I think hear in my area the overpopulation of black bears are the biggest problem with fawn mortality. Most of our deer hunters wont shoot bears. Most of them tell me that bear meat tastes bad. I offer to give them some of mine and tell them how to properly handle a bear after they get one. I have had some change their minds after eating some of my bear meat. Bear meat is very good table fare with reasonable care taken during cleaning and processing. I try to get most of the fat trimmed well. I think we lost a young goat a few months back. I didn't actually see the remains. We got some steep brushy land that is hard to cover on foot. We definitely got black bears. not sure what killed it. I found a small dead fawn yesterday just about the size I had seen the doe with last week. It was on the small size compared to the other fawns here. She had a late birth it seems or it is a runt of sorts. Had a coyote kill a yearling ram early yesterday morning. Left the carcass for the buzzards in hopes of drawing some attention. Glassed over the kill site from about 350 yards yesterday evening and low and behold there was wylie coyote having a snack. I made an attempt to stalk with in shooting distance but the cover was sparse, and wylie soon lost interest and got tired of chasing the buzzards. Followed him for about a mile, but could never make any ground due to only having the sparse cover of a few cholla cactus here and there. Well, he finally got over a hill and I knew I wasn't going to make the ground up fast enough to keep up so I let him go. Besides I had an idea of where he was going. Made a run around that pasture this morning and found the crossing where he went out last night, as well as another he has been using. Coyotes, and sheep, the work never ends. She looks to be in bad shape. Yeah, she was pretty rough. Cost of raising puts when it's really hot and dry. The last (This word is unacceptable on Trapperman) I caught with pups was thin like this, although this one had a lot more hair rubbed off. Caught the on it this pic this morning. She was not raising any pups and was in much better shape. Nursing pups is very demanding on the females in areas that has limited food sources as well as being drained physically from the heat, little water and lack of adequate nutrition. These conditions many times are responsible for domestic kills since they are easy prey. They all have guilty looks on their faces . . . Hahahahaha! !I think the same thing every time I catch one this time of year. Since first commenting on this thread I've caught 7 going into or out of sheep pastures, or within a half mile of sheep pastures. All this country around here used to have sheep, and everyone trapped and had coyote drives. On top of that there were government trappers. Pretty easy to keep the numbers down when everyone is working on them. Now I have 1 out of 6 neighbors that traps as much or more than me. Oh well gotta do something. Bob what kind of sets did you use in catching the yotes this time of the year. Were right in the pasture or on the out skirts of the pasture. 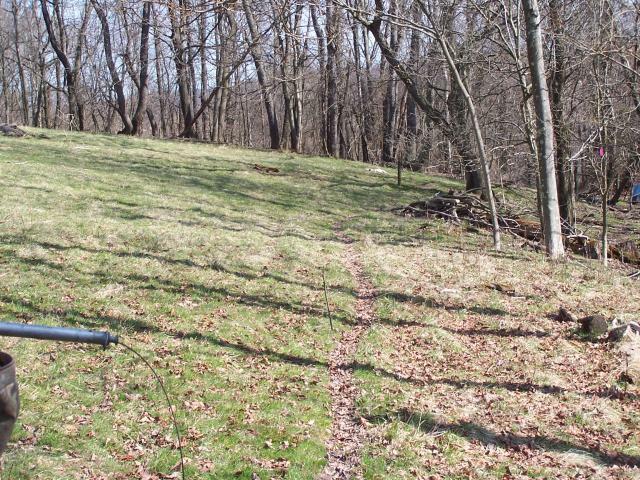 I set snares on the sheep trails on the interior of the pasture and a mix of ground sets along the fence and trail edges. Scent posts and walk thru sets usually get them quick if they return to the kill sites. Problem is many times they kill and may not return for weeks at a time before they kill again. 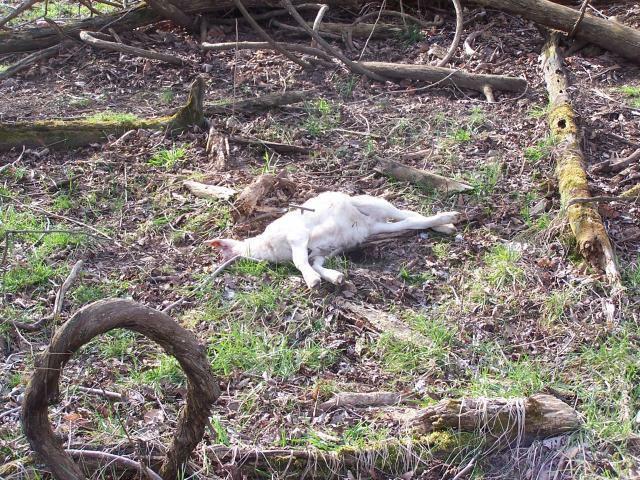 On many calls I get the coyotes always seem to kill many more lambs then they eat or try to drag off. They kill for sport or fun it seems far to often. They will be teaching the pups how its done before too long. that is the problem I have had in the past. Was called into a farm for some coyotes killing lambs. They came in twice before I was called. I was there for 2 weeks and they never returned. 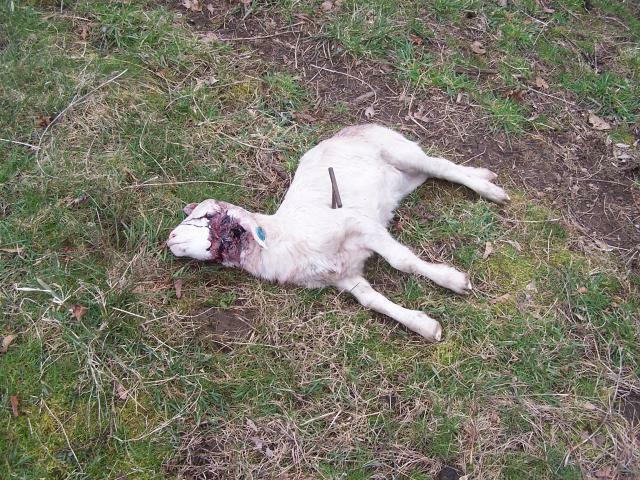 Just caught one around a pasture where lambs had been killed and eaten. It took several days to get a permit and then 2 weeks after setting the traps. We have had a lot of rain and everything is green so sign is hard to find even on the 2 tracks but I knew they had to be around at some point. From the comments on this thread, sounds like I am not the only one seeing long wait times for them to come back.